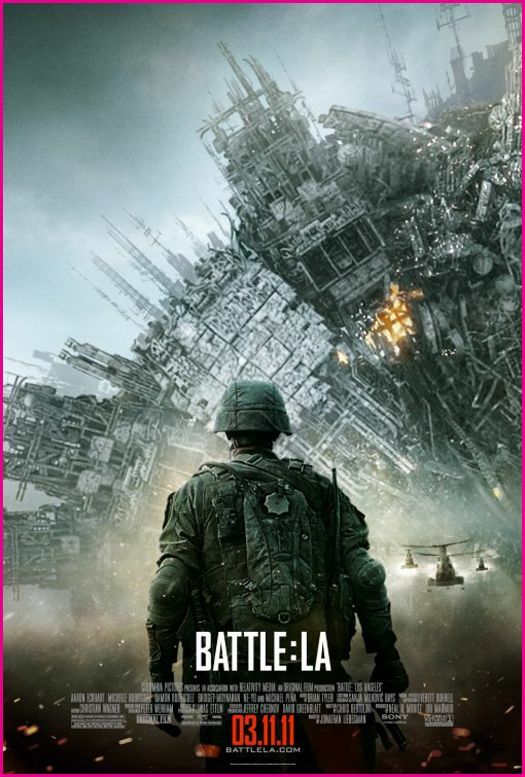 Okay, after a season of some stellar films like The King’s Speech and The Social Network, the Battle for L.A. pales in terms of movie art and plot. However in the genre of popcorn movie fun, it wasn’t bad. Yes, it was pretty formulaic. However, there was enough of the “rug being pulled off the human race” story line with special effects action that kept my interest. On the wake of the Japan earthquake and tsumani and the general feeling of vulnerability that we as humans have been subjected to as of the past few years, the film definitely tapped into that psyche. So what happens when all of sudden, within less than 24 hours, there is a complete invasion of alien forces that starts wiping out the human race( almost like a nuisance pest) to take the natural resources of the planet? Horror. The plot has been done before. What makes this film better, it really takes it down to a personal level and seen through the eyes of marine unit and some civilians. It is frenetic and done in a real time setting so you feel the paranoia and overwhelming odds of the situation. There are some good moments in the film as the main characters figure out ways to battle the aliens and survive. Yes, you actually get caught up cheering for the marines. Why not? It is good to feel like we are winning some battle against some Goliath, especially when real life does not seem to give us such wins. So this bit of escapism was nice in the middle of March. I had a fun time with it too.